Home › Branding On Pinterest › Pinterest Meme Good or Bad? Memes are all the rage in Pinterest. What’s a meme you ask? Meme: Comes from the ancient Greek mimema – ‘to imitate’. They are social concepts that self replicate and mutate – and in Pinterest they ride on images. Sometimes the images are a brand or product shot, sometimes just a picture. 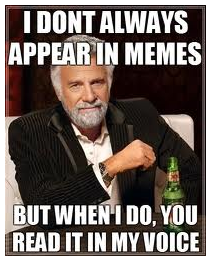 So let me ask you – If a meme was built around your brand, product or advertisement, would you be happy? Or hacked off? Is this good for Dos Equis or bad? I have my opinion, I’d like to know yours.